My interview with Max Wallack, founder of Puzzles To Remember, an organization that provides puzzles to nursing homes that care for Alzheimer’s and dementia patients, proves that no matter how old you are, you can make a huge difference in the fight against Alzheimer’s disease and dementias. Wallack first witnessed the devastating effects of Alzheimer’s disease when he was just a child. His great-grandmother suffered from AD, and it was watching her descent into the darkness that prompted Wallack to do something about it. When he was 12, he started collecting and donating puzzles to facilities that cared for Alzheimer’s patients. And when he was 14, he worked with a philanthropic group to create puzzles that were geared toward patients with memory loss. 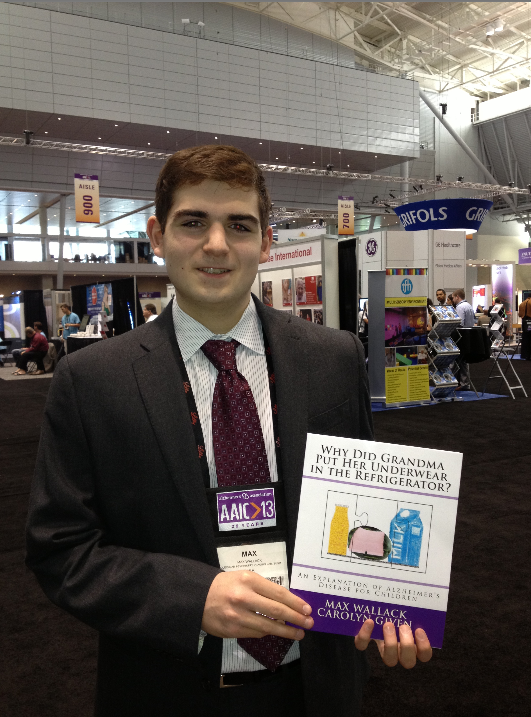 Today, he’s a student at Boston University and a research intern in the Molecular Psychiatry and Aging Laboratory in the Department of Pharmacology and Experimental Therapeutics at BU’s School of Medicine. 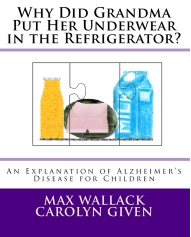 Below, Wallack talks about the book, his advocacy work and how you — and your child — can become advocates and help #ENDALZ! You’re incredibly active in the world of Alzheimer’s and dementia… What spurred this interest and what are you working on today? I have always been interested in science and in inventing. I won my first invention contest at the age of 7 when I made a special step to help elderly people get into minivans. I made it for my great-grandmother, who accompanied me and demonstrated the step at the awards ceremony in Chicago. As I grew older, my interest in science, and specifically medicine, increased. Of course, this was spurred on by Great Grams progression into Alzheimer’s disease. I read more and more about this subject. Today, I am very involved in Alzheimer’s research. An article I coauthored will appear in September’s Journal of Alzheimer’s Disease, and I am in the process of writing up several additional articles. My work has focused on three areas: 1. Enzymes that can be used as biomarkers to test for early AD, including the differences in results between males and females 2. The effects of ACE inhibitors on AD patients and 3. The use of a naturally occurring hormone, already approved for use with diabetic patients, which seems to be capable of clearing significant amounts of ABeta from the brains of transgenic mice, and we are already beginning human trials with this hormone. Talk to me about the founding of your organization Puzzles to Remember — what is it, what inspired its creation and how old were you when you decided to create PTR? During the last few months of Great Grams’ life she was in and out of hospitals and nursing facilities. When I visited her in those facilities, I noticed that patients who were working on jigsaw puzzles were calmer and less agitated. I researched this, and I found that cognitive activities, such as jigsaw puzzles, can help extend the time during which an AD remains functional in society. I decided to start collecting puzzles and donate them to the facilities that had cared for Great Grams. Soon, I realized I needed a means of accepting donations so that I could send puzzles to more distant facilities, and, when I was 12, I applied for 501c3 status. I also found that there was a dearth of puzzles that were most suitable for Alzheimer’s patients, so I contacted Springbok Puzzles. They had previously donated to my cause. Springbok is a very philanthropic company, and together we developed the Springbok Puzzles To Remember. These puzzles, developed in 2010, when I was 14, have 12 or 36 large sized pieces with bright colors and memory provoking themes. To date, I have distributed over 24,500 puzzles to over 2,050 facilities around the world. There are many young people who have been touched by Alzheimer’s disease and other dementias. What advice would you give them if they wanted to become advocates and make a difference in the lives of those suffering from the disease? How can they start? This is the same question I get asked frequently about philanthropy. My answer is, start small. Do something to help Alzheimer’s patients or caregivers. Visit a facility. Join a group for Alzheimer’s patients or caregivers. Help out in a memory café; there are many of those just being set up. Sign up for an Alzheimer’s Walk and help raise funds. They can do just one of these things, or as many as they wish. The point is to just get started. When did you decide it was time to write a book about dementia for young kids? Was it your idea or were you approached? I have been writing this book in my head for years. One day I asked Carolyn Given, my former middle school English teacher, if she would coauthor such a book with me. She said she would, and, within two hours, I wrote and sent her a completed first draft. Of course, the book underwent several revisions after that, but I was able to write it so quickly because I had thought about it for so long. Talk to me about the scenes you witnessed growing up with a great grandmother living with dementia, and what, if anything, ended up in this book? As part of her AD, Great Grams suffered from extreme paranoia. The story I tell most often is that when my whole family visited Hawaii a few months before Great Grams’ death, I got to meet many, many native Hawaiians. Apparently, when someone goes up to a Honolulu police officer and says “those people are trying to kill me,” they are required to do an investigation. So, when Great Grams got out of her wheelchair and ran to the police officer with that story, I got to meet most of the Honolulu police force! Great Grams also had many fears. Many fears are represented in the book, although they might not be identical to the ones Great Grams experienced. The scene of the police officers bringing Great Grams home is one that is emblazoned in my mind. It happened more than once. Through the Alzheimer’s Reading Room, I have interacted with Alzheimer’s caregivers for many years now, and I have formed great friendships with some of them. Some of the scenes in the book are based on the experiences of a family in New York City that has a grandmother with AD and a 6-year-old daughter that has assumed a caregiver role. Some of the illustrations were actually redrawn from photos of that family, including the one with the little girl feeding her grandmother off a red plate. Talk to me about the scenes you and your co-author came up with and how they came to be. What messages did you want to your young audience to come away with? Some scenes were based upon my experiences, some were based upon the NYC family’s experiences, and others were developed to convey messages about Alzheimer’s disease. I wanted to write a book that would not be “dark” or frightening, as many other AD books for children seemed to me. That is one reason that I asked for Carolyn Given’s help. I knew she would keep the book from becoming too dark, and perhaps even add a bit of humor. I wanted the book to actually provide children with some helpful coping mechanisms, something which I could find in no other book. I wanted to assure children that they were not the cause of any aspect of this disease and that this disease is not contagious. I wanted to touch upon some difficult topics such as incontinence and wandering in a way which children would understand. I also wanted to provide a simple understandable visual image of what is taking place in the brain of someone with AD by showing a nerve cell throwing and catching a message both in a healthy cell and in one with AD. I love the title of the book. What inspired it? Alzheimer’s patients often place articles in strange places. I just was trying to present an image that children might find amusing. What do you hope to achieve with this book? Is it geared towards kids who have a parent or grandparent or great grandparent living with dementia or is this something you hope all kids will read? When I wrote the book, I wrote it expecting it to be just for children. What has surprised me is the large number of reviews that say that the book has a lot to offer for adults, as well. I wrote the book to help child caregivers. However, with the growing number of AD patients, almost every family is touched by this disease in some way. I think all children can benefit from reading this book. In the case of the NYC family, the children of their neighbors have read the book and now interact much more constructively with the grandmother. Striving to understand other people makes us more empathetic and more kind as individuals. My favorite part of the book is when Julie decides that she might become a scientist and help find a treatment or cure for AD. I think it is very important to provide hope for the future. The drawing of three scientists in the lab is actually a drawing of me, Dr. Qiu, my mentor and Principal Investigator, and Dr. Zhu my mentor and co-worker. I also think it was important to mention clinical trials at the end of the book. Willingness to participate in clinical trials is a necessity in order for us to find treatments and/or cures. How have children and their parents received this book? The response to the book, from everyone, has been just wonderful. Parents have used the book almost as a manual to explain specific behaviors that the child is witnessing. I have heard that children have been able to interact much more constructively once provided with some useful coping mechanisms. I have even received notes of appreciation from 6 year olds. I am surprised and pleased that word about the book has spread around the world. A company in Singapore that makes children’s toys and assistive aids for seniors contacted me and wants to purchase 40 books to distribute to facilities there. Apparently, information about Alzheimer’s disease is not very easily available in Singapore. They hope to use this book to bring light and attention to this disease. What advice would you give to a young person watching this disease unfold right before their eyes? No part of it is your fault and you cannot catch this disease. The person with AD is the same person they have always been. They have not turned into someone else. You can still enjoy many interactions with them. There is still “more there” than may be easily apparent. Art and music are great avenues for interactions. Many people are working very hard to try to find treatments and cures. Maybe you can help. What’s next for Max Wallack? I will continue working in the research lab. I love my work there, and I learn more there than anywhere else. I will continue my studies at Boston University and then, hopefully, attend medical school and prepare myself to become a Geriatric Psychiatrist, working with patients and their caregivers. Why Did Grandma Put Her Underwear in the Refrigerator? Max has already done so much for the Alzheimer’s community in his young life. I can’t wait to see what amazing things he does in the future, especially in the area of research. I first met Max when I interviewed him for my book, “I Love You, Who Are You? Loving and Caring for a Parent with Alzheimer’s”. He was much younger then but was completely and totally devoted to raising awareness about Alzheimer’s and supporting those on a journey with a loved one and the disease. He’s already made such a difference in the world and I believe he’s only getting started. Immense congratulations, Max!